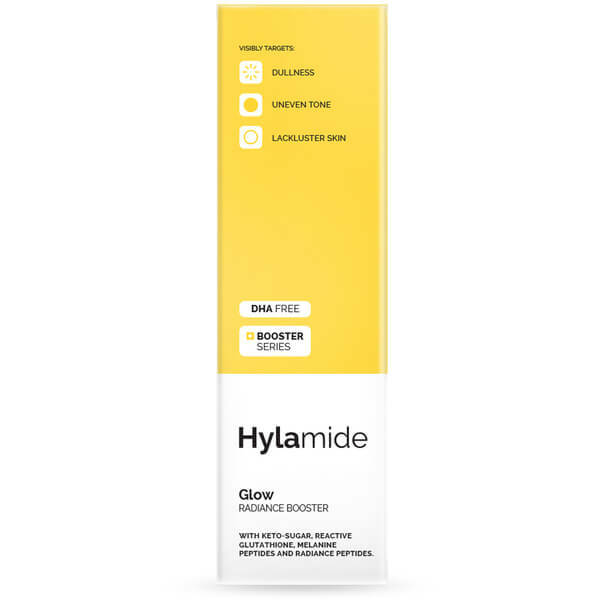 Inspire natural luminosity with Hylamide's Glow Booster, a fast-acting serum that works to add radiance to dull, lack-lustre skin. Utilising a host of innovative technologies, including Raspberry derived Keto-Sugar and Melanin Peptides, the solution works quickly to counteract dullness, encouraging a glowing complexion whilst building a golden glow within two to three days. Keto-Sugar reacts with skin to produce a sunkissed glow, whilst reactive Glutathione helps visibly even skin pigmentation for a balanced, healthy-looking complexion. Skin looks naturally illuminated and glowing. Free from water, alcohol, oil, silicone and nuts. 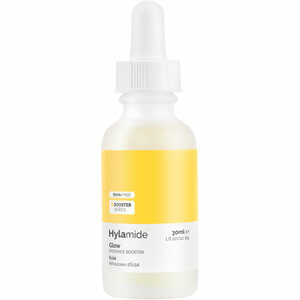 Apply twice daily as adjunct skincare to offer radiance and a golden glow. This product contains a Raspberry derived alternative to the self-tanning ingredient, DHA. Please wash hands thoroughly after application and ensure even coverage to the face. Aqua (Water), Erythrulose, Glycerin, Ppg-26-Buteth-26, Propanediol, Acetyl Hexapeptide-1, Dextran, Ethoxydiglycol, Dimethyl Isosorbide, Oxidised Glutathione, Citrulline, Citrullus Lanatus (Watermelon) Fruit Extract, Polypodium Vulgare Rhizome Extract, Cetraria Islandica Thallus Extract, Sphagnum Magellanicum Extract, Lactobacillus/Eriodictyon Californicum Ferment Extract, Phytic Acid, Phospholipids, Acacia Senegal Gum, Xanthan Gum, Trisodium Ethylenediamine Disuccinate, Peg-40 Hydrogenated Castor Oil, Leuconostoc/Radish Root Ferment Filtrate, Potassium Sorbate, Sodium Benzoate, 1,2-Hexanediol, Caprylyl Glycol, Phenoxyethanol, Citric Acid, Linalool, Farnesol.